Buried in the archives of the British Museum, this wonderful series of 26 landscape scenes, using the shapes of letters to form idyllic scenery, was designed by illustrator Charles Joseph Hullmandel who was one of the most important figures in the development of British lithography in the first half of the 19th century. 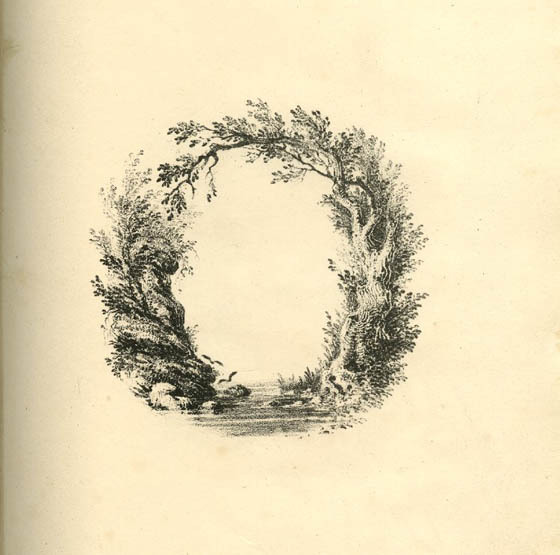 These particular pieces were produced sometime between 1818 and 1860. It is hard to believe this glorious series was created in 19th century. Quite impressive, right? 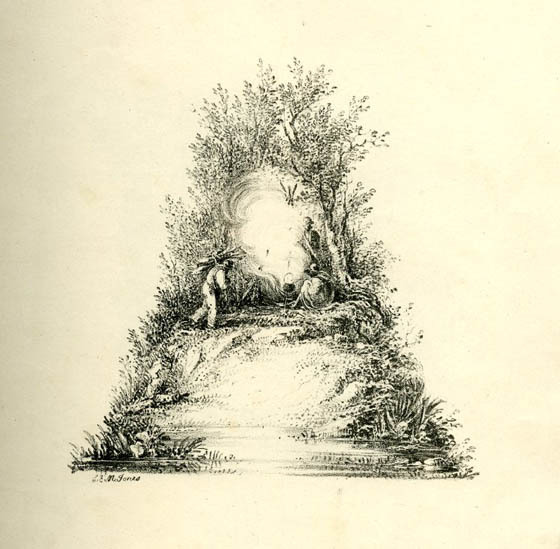 Letter A: upper part composed of three figures around a fire at the edge of a slope to small pond, forming the lower part of the letter; outline by trees. 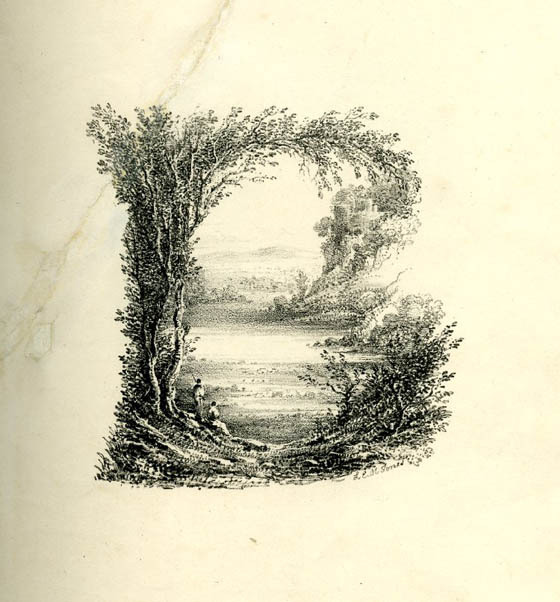 Letter B: a vista on level country, outlined by trees and branches and the edge of a rise with two figures as the bottom part of the letter. 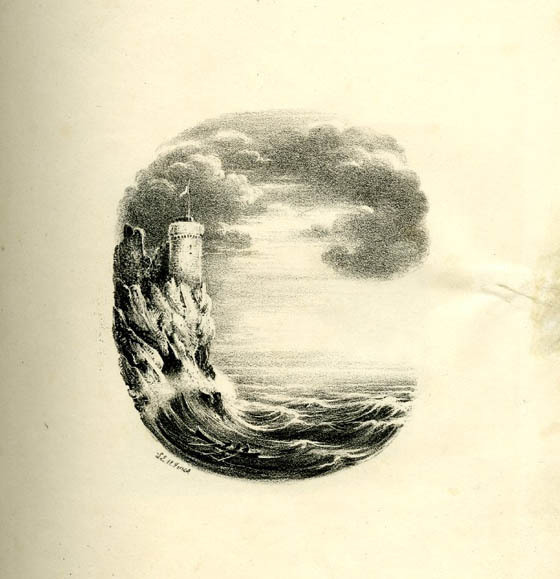 Letter C: a castle on cliffs on the left; waves of the sea shaping the lower curve, clouds the upper one. 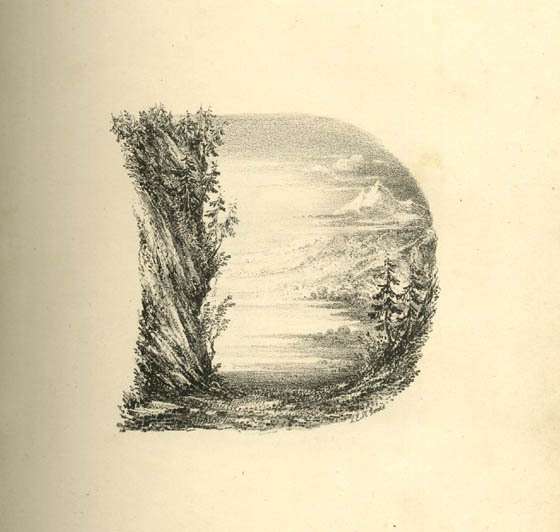 Letter D: a semi-circular landscape scence with mountains in right distance; a crag with trees shaping the left outline of the letter. 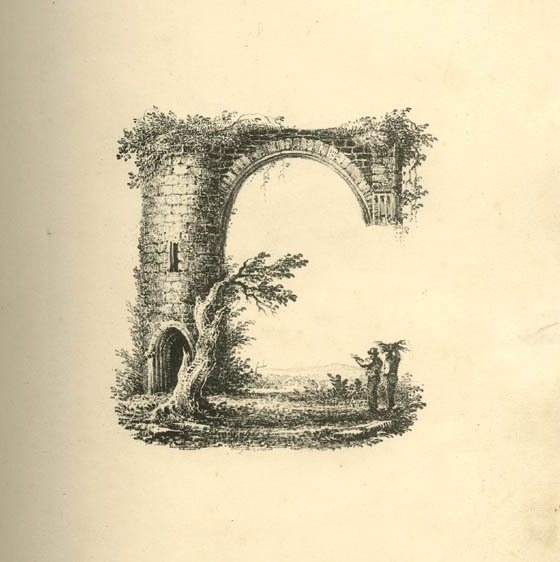 Letter E: a ruinous gate, the right part of its arch broken, a tree on the left stretching to the right and two men standing on the right pointing at the ruin. 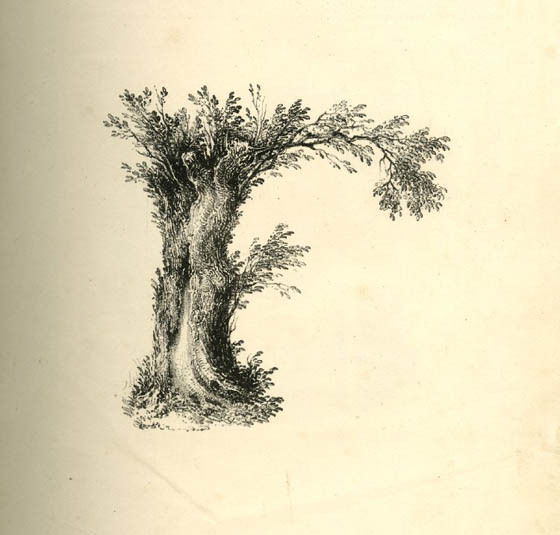 Letter F: a tree trunk and two branches stretching to the right at the top and in the middle. 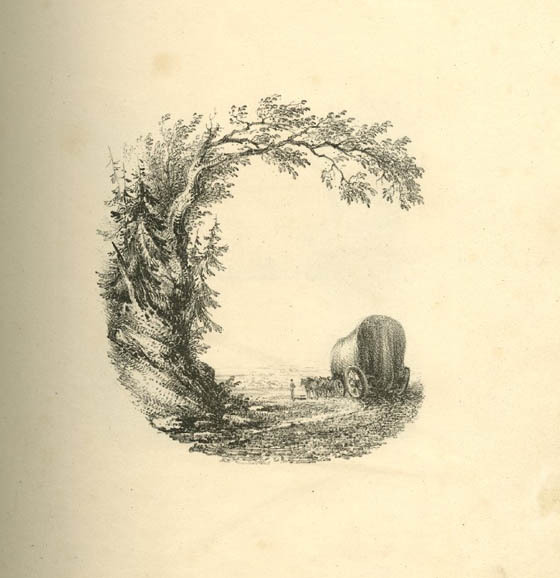 Letter G: a country road winding in a curve to the right with a horse-and-cart at its end, and sided on the left with trees, their branches shaping the upper curve of the letter. 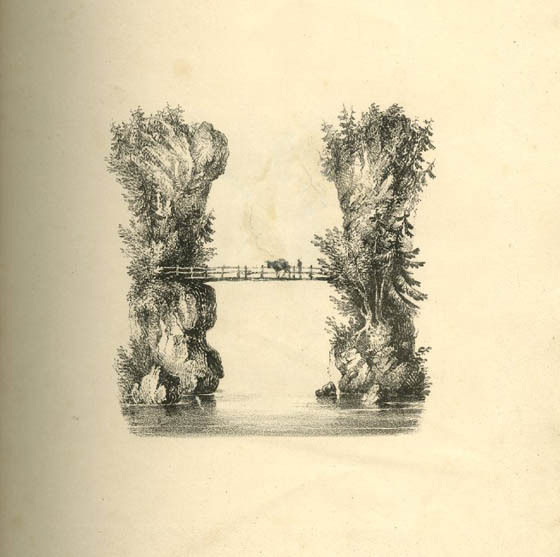 Letter H: two rocks at a lake connected by a bridge crossed by a figure and a cow. 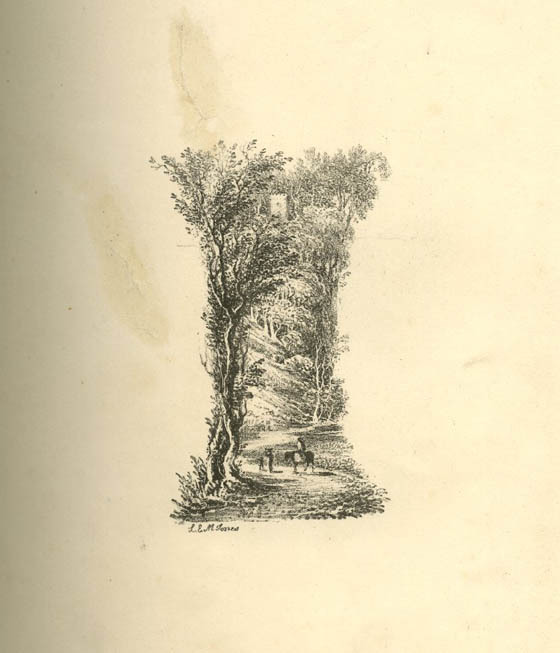 Letter I: a country road with three figures, one on horseback, sided by trees as left outline, and meandering up to a castle as upper end of the letter. 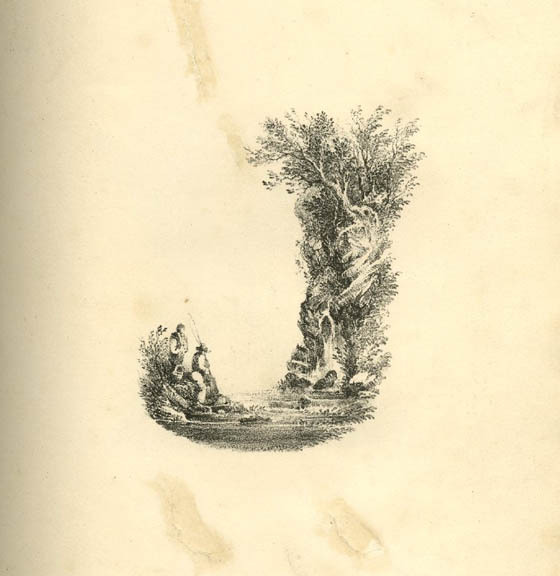 Letter J: bottom curve formed of a lake with two fishermen standing on the left, right outline shaped by a rock with small waterfalls and surmounted with trees stretching to the left. 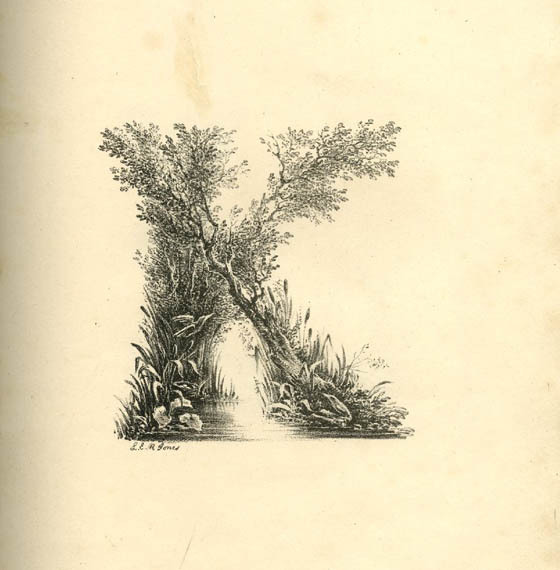 Letter K: two trees growing on each side of a river, crossing over it; surrounded with reed at the bottom forming the serifs. 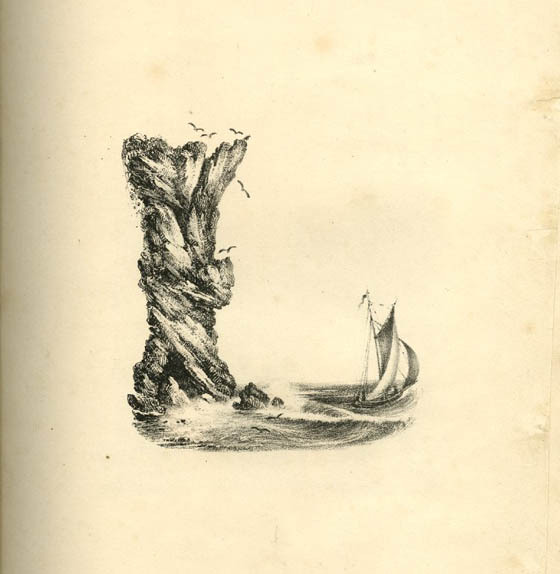 Letter L: a seascape with a cliff and flying gulls as left outline, the sea shaping the bottom outline, a sailingboat as serif on the right. 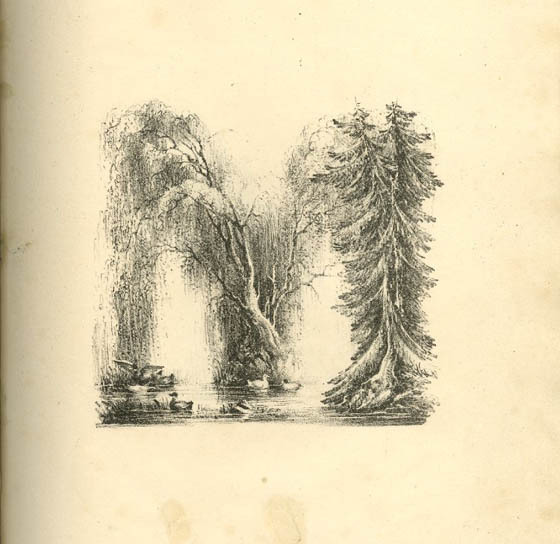 Letter M: composed of willows and a spruce growing at a pond with ducks on the left; the branches growing into opposite directions outlining the two triangles of the letter. 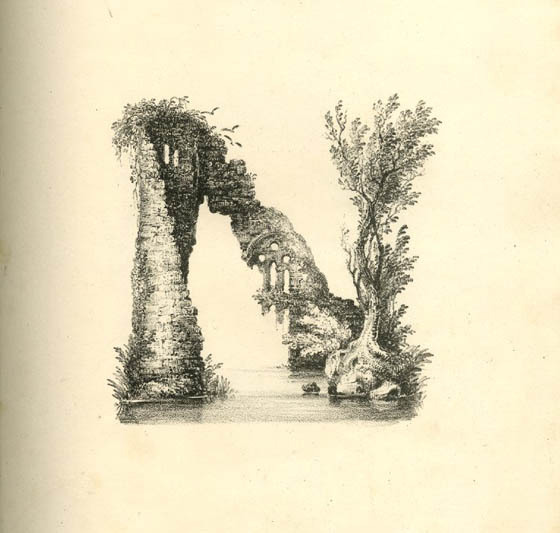 Letter N: composed of a triangular shaped ruin to left and a tree to right, located at a river or lake. 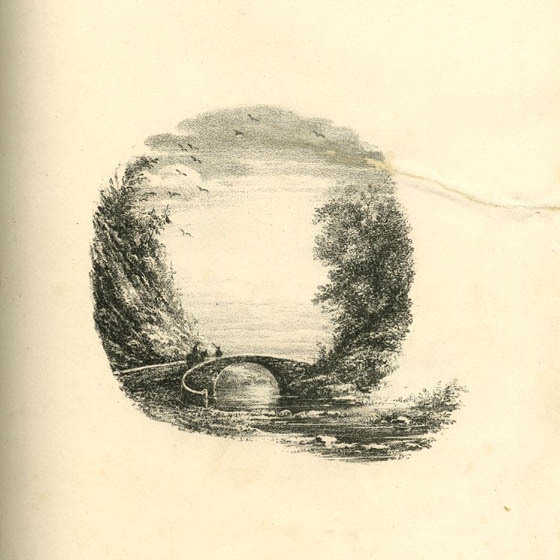 Letter O: a river as bottom part of the oval, sided by a rock on the left and a tree on the right, its branches growing to the left forming the upper outline of the oval. 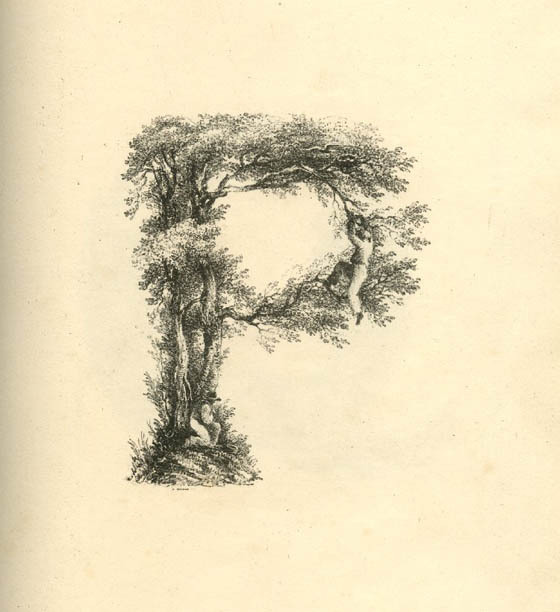 Letter P: a tree with two branches growing to the right and connected by a man, standing on the lower branch, clinging unto the upper. 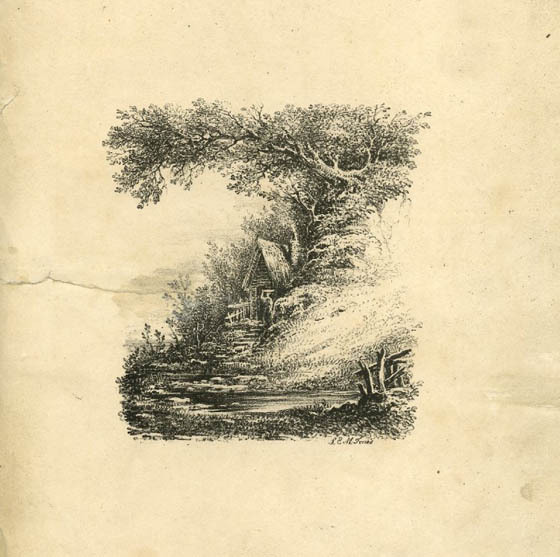 Letter Q: bottom composed of a river winding from right to left and a stone bridge spanning over it from left to right shore; outlined at left and right by hills with trees. 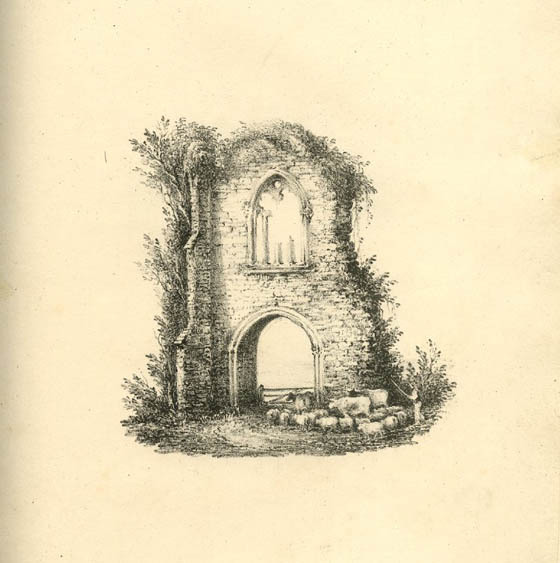 Letter R: a ruinous wall with arch and pointed window above it, a shepherd herding sheep and cows through the arch. 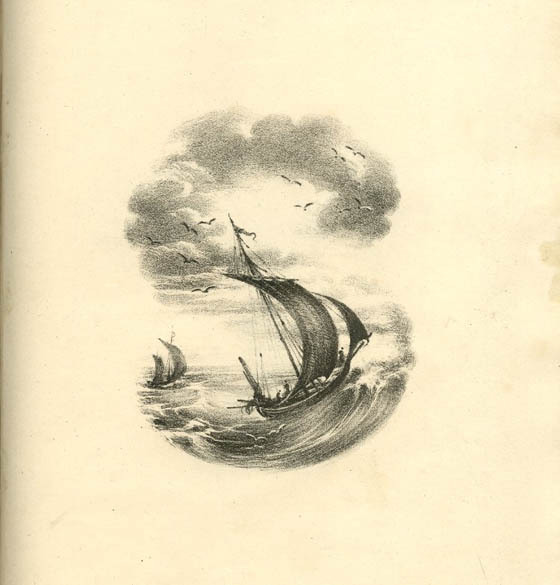 Letter S: composed of two sailing boats one on distant left, one in foreground carried to the right by a wave, and of clouds and seagulls above. 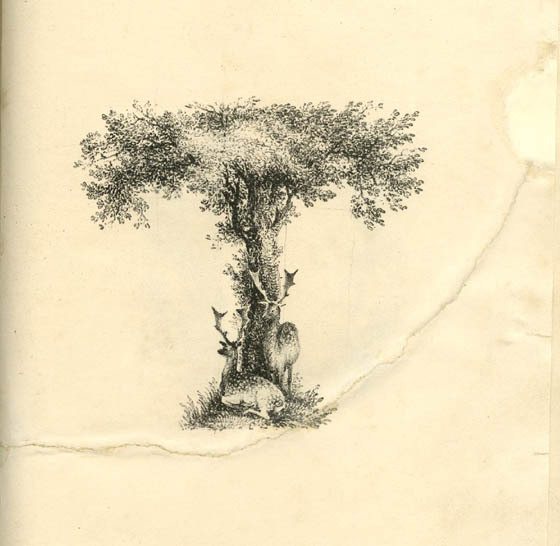 Letter T: a tree with a flat treetop spreading to left and right, two stags to the foot of the tree trunk. 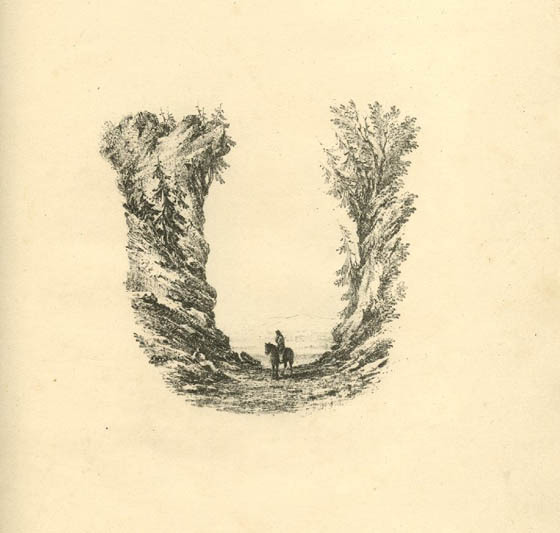 Letter U: a valley with rocks on the left and trees on right side and a figure on horseback in between. 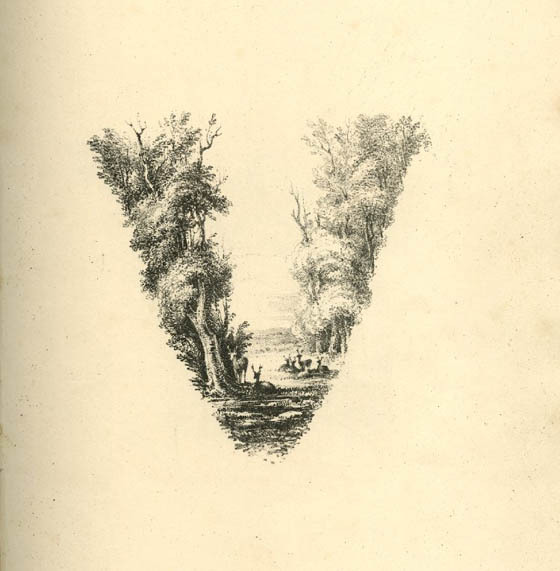 Letter V: composed of a wood with a clearing at its centre, stags lying or standing on the lawn. 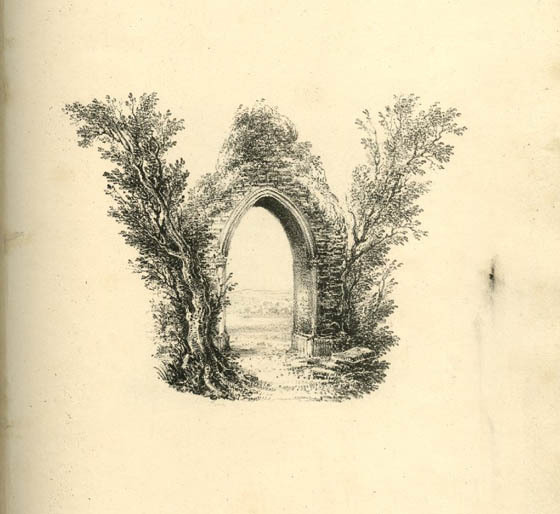 Letter W: a ruinous mossy pointed arch in landscape, flanked by two trees growing in opposite directions. 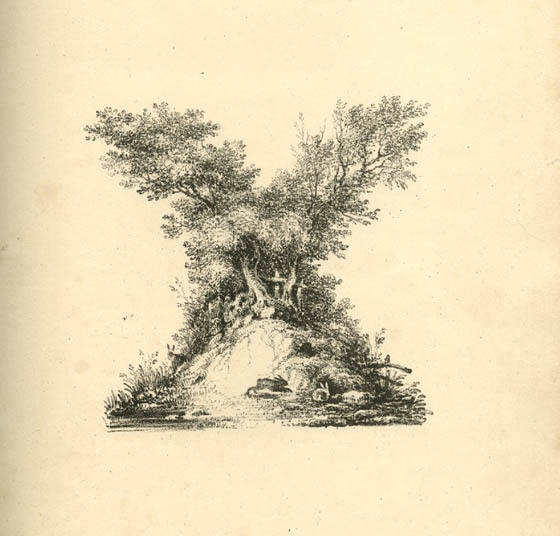 Letter X: composed of a small hill, sunlit on the left side and surmounted with trees growing into opposite directions; hares at the foot of the hill. 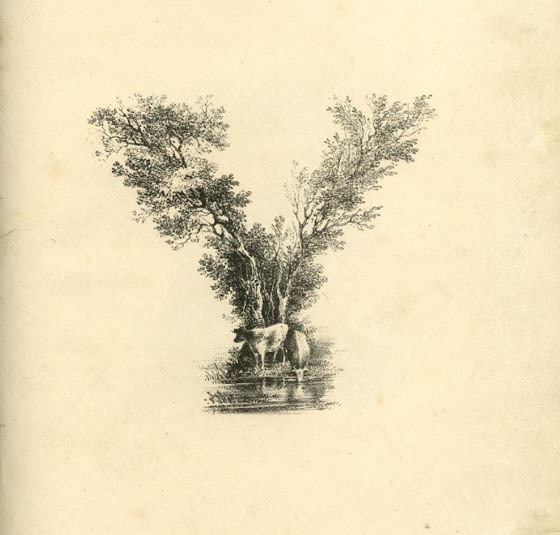 Letter Y: Two juxtaposed trees, growing at a river and stretching into opposite directions; two cows in front of trees, the right one drinking out of the river. Letter Z: composed of a pond at bottom, from which some steps lead up to a small hut over which a tree is stretching to the left.